I love something shiny! So does my daughter. I take full responsibility for her shiny obsessions and any"crazy" she may manifest in the future. She is five and I love her to death. That little girl is my little buddy in every since of the word. She has a great desire to help me with my projects (she is quite the little helper…wink,wink!) Her heart is always ready and willing for a trip to the craft store, her little brain is constantly coming up with ways I can improve, and I can count on her to have my back! Aggie is the first to tell me I am beautiful, that my pants are too tight, or I have spilled something on my shirt! She is always watching out for me...Love you Aggie! My only problem, I have to hide my shiny things from her...Shoot! 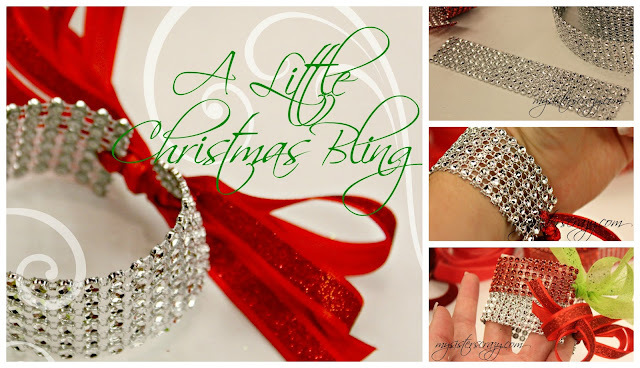 Her love of all things “bling” has been my inspiration for the following Christmas Crafts! I figure If she has her own… she will leave mine alone!?! Probably not! But, it's worth a shot. These are fun, fast, and fantastically shiny projects will attract bling lovers of all ages. 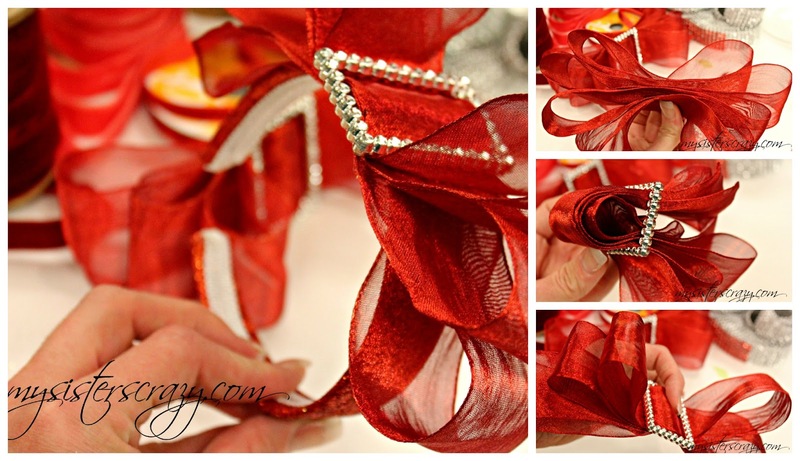 The Christmas Headband…Love! I was standing in the kitchen hot gluing these babies together and “AG” ( as we lovingly call her) walked in and said, “Mom, are you always going to make me crazy headbands!?! ?” Of course my answer was, “YES, my dear.” She just smiled her beautiful smile and walked out of the room. I don’t really know if that was her way of showing approval or disgust. Either way, I keep making them and she keeps wearing them. Until she won’t wear them anymore…I’m gunna keep hot gluing crazy headbands together! The supplies are bits and pieces of random shiny leafs and tiny balls. I use velvet ribbon cuz it looks "RICH" :) I have also used ornaments from the "Mart". Most of the things I have purchased are readily available and fairly cheap! I use a lot of floral picks in my headbands. They seem to be the perfect scale. The red glitter headbands came from the dollar section at Joann’s. I cut the small plastic stand from the bottom of the bottle brush tree. Then I hot glued the tree on the head band to sit slightly off center. A word of warning, the hot glue melts the tree a little, don't worry...just smash it on and hold for a few seconds. 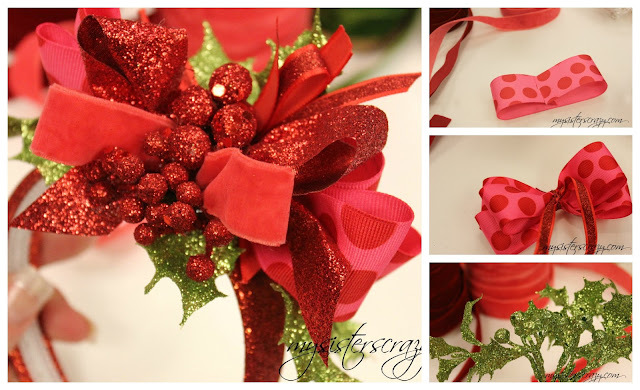 Then, I tied several simple bows from red glitter ribbon and hot glued them to the headband underneath the tree. Gluing the knot "inward" pushes the loops and tails facing "outward" making things look fuller. TA-DA! Done! When I showed this headband to Aggie she said “Where am I going to wear THAT?” My reply,…”Where WON"T you wear this!? !” Cookie party at our crazy Aunt Tamara’s house...here we come! I am also thinking an Ugly Sweater Party...HECK YEAH! And for my next trick...an ornament hat! I bought this top hat ornament hat at the "Mart". Thank you Walmart...your ornaments were darling this year! I pulled the ornament hanger out of the top of the hat, clipped the glitter leaves from a white poinsettia flower, snipped some red velvet, and green glitter holly. The leaves were glued on the headband first. 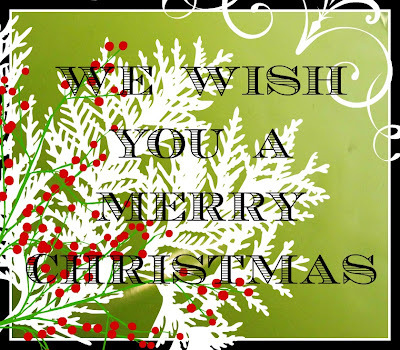 Then the hat, ribbon, and last the green holly. Where to wear this one?....Oh, her Kindergarten Christmas performance! She has to wear jeans and a white t-shirt. This will top it off grandly! Can't wait to hear those little Kindergarteners sing Rudolph! :) Don't worry Ag, even if you mess the words up...you will look fantastic! This next headband happens to be my favorite...just a touch of pink! Very girly and yet...still very merry! I double over ribbon and tie it in the center to make bows then layer different textures and colors. 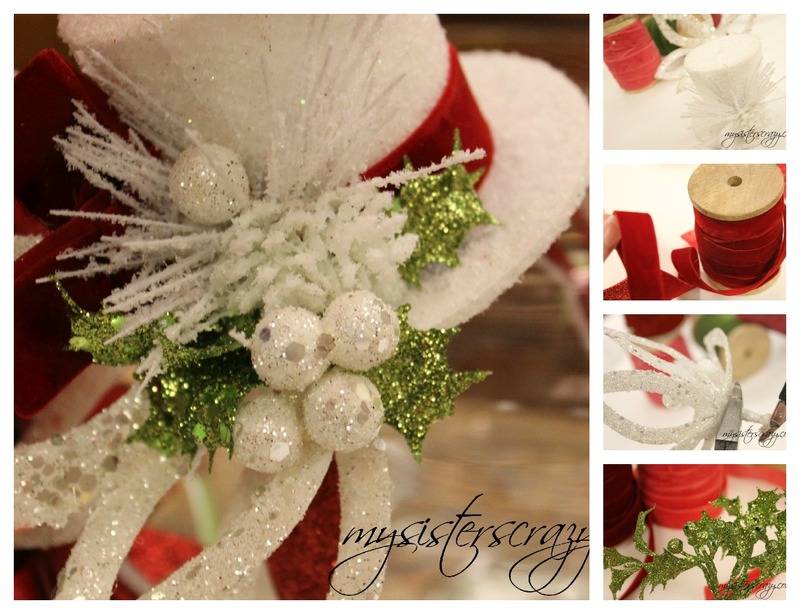 Then hot glue the bow onto the headband followed by bits of green glitter holly and red glitter berries. This also happens to be Aggie's favorite! You are adorable AG! Last but certainly not least...the fancy headband. Admittidly it is a bit large...but, COME ON...it is Christmas! I ordered bling "belt centers" from saveoncrafts.com. They were really cheap. I got 12 for under 4 dollars. I will be using them on packages, on headbands, and what ever else this season that screaming for bling. They are easy to use! Using a continuing length of ribbon, I fold the ribbon over several times. This creats three loops to each side. I make sure the loose ends wind up at the bottom. I slightly pinch the ribbon so it will fit through the belt buckle. Once it is in, I re-fluff the loops and it makes a fantastic giant bow. This is a super fancy bow...it will probably be the bow she wears to Church on Christmas. She definitely will not be lacking in the headband department this holiday season! Give me a break, I only have one girl...I am gunn live it up! Excuse my ignorance but I don't even remember what this next stuff is called. All I know is that it is like 3 or 4 bucks a yard in the store. I found it on line (same place as the buckles) The whole spool was about 5 bucks! It is fun stuff! I bought both red and silver! I figure I can use it in wrapping, maybe a belt, or a little Christmas wrist bling. This stuff makes quick work of a holiday bracelet! All I did was cut a length a little smaller than my wrist and threaded ribbon through the tiny holes on both sides. The ribbon can be tied together for a beautiful bow closure. I have also been thinking this would make a great wrist corsage for a dance. You could attach the flowers right on! DARLING! Too bad Aggie is only five...No Prom for this girl! 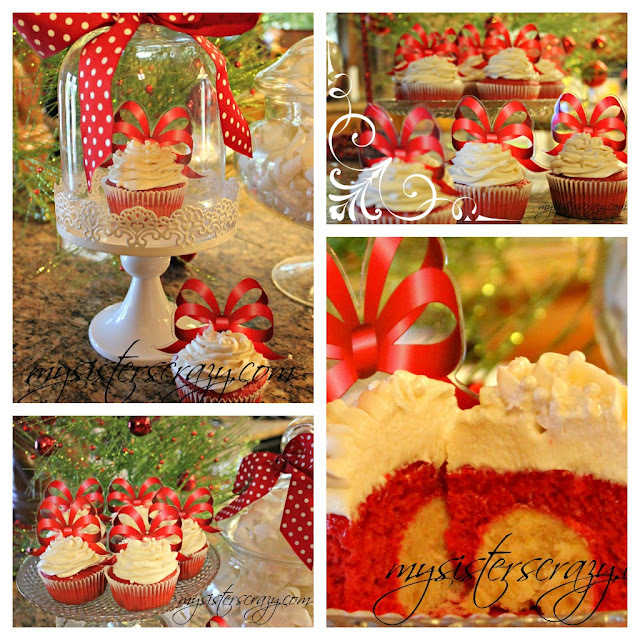 CHRISTMAS TREATS... SWEETS FOR THE SWEET! Visions of Sugar Plums dance in my head! Christmas just isn't Christmas without a little treat making. 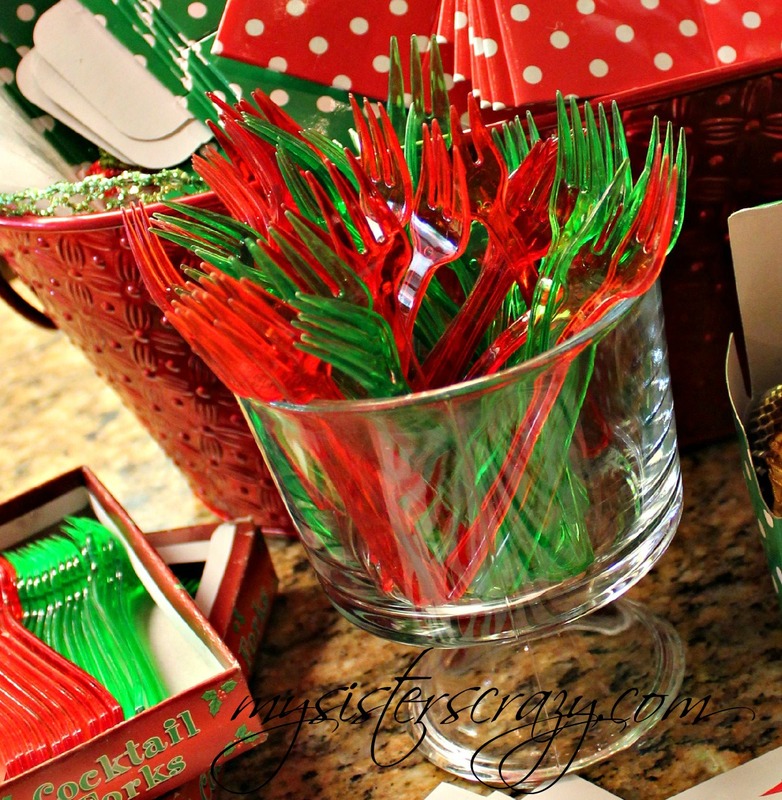 Preparing Christmas treats is one of my favorite Christmas traditions. I'll admit, I like a good treat...BUT, watching those I love enjoy a gathering, a party, or even a simple Christmas cookie is satisfaction to my soul! Nothing beats the smell of fresh baked anything! 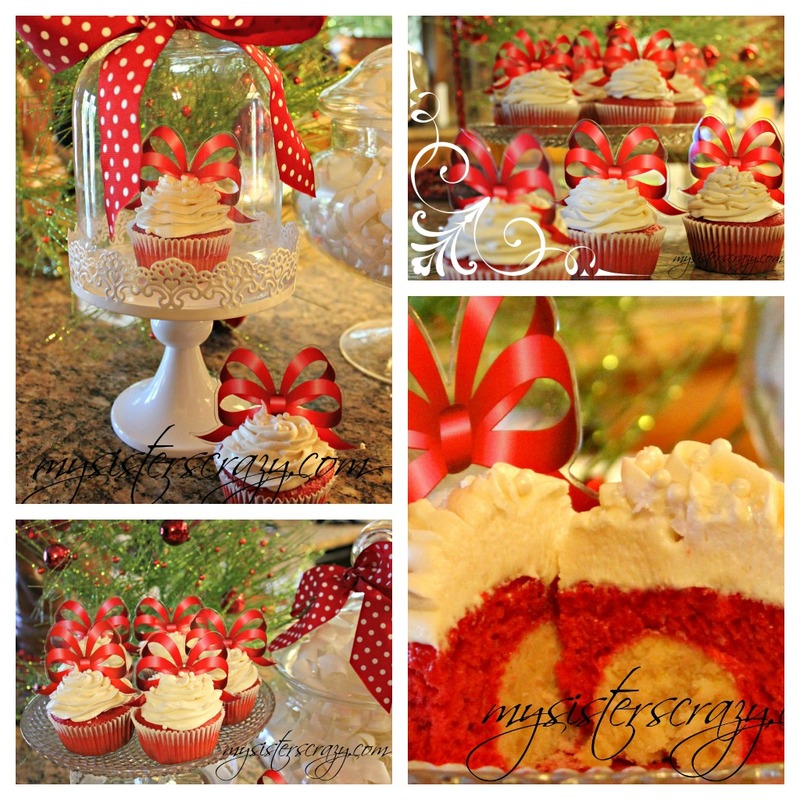 I soooooo loved the Cake Pop Centered Pumpkin Cupcake this Thanksgiving that I am giving a Christmas version a try. RED VELVET! YUM! It worked like a charm! I used the exact recipe that is posted in "Pumpkin Palooza", only I used a Red Velvet Cake mix. You can either use a chocolate cake mix and add Red Velvet Coloring/Flavor or buy a Red Velvet cake mix. For this cupcake I used a cake mix and followed the instructions on the package except...now, here is the big secret...I used chocolate milk instead of water, and melted butter instead of oil. AND, I always add just a little cinnamon to a chocolate batter. Not a lot, just a teaspoon. The cake pop center was done exactly the same as in the pumpkin flavored cupcake. I AM IN LOVE! F.Y.I. This also works well with a mini cupcakes. I made the cake ball center just a little bigger than a marble. It is a great size..they were adorable. Also, if these seem too much work for one day, you can make the cake pops centers several days ahead. I made them, lined them on a cookie sheet in a single layer, and stuck them in the freezer. After they were frozen, I took them off the cookie sheet and put them in a Ziploc freezer bag. The day I wanted to make the cupcakes, I laid the cake pops back on a cookie sheet and allowed the to thaw...it seems like way less work this way! To watch this post on News Channel 12 Click her! When my teenager was a small boy he said to my mom, “Nanny, your tree couldn’t be any merrier!” He was about 3 ½ years old. Even the little guys appreciate a merry atmosphere. I don’t believe she has ever received such a genuine compliment about her Christmas presentation. His eyes were wide with excitement as he sat in front of her Christmas tree. I come from a family that made a pretty big deal over Christmas. The trees were loaded, the house smelled like cookies, and the nativity dress-up box was stuffed to the max with shiny bathrobes and long shiny beads. Making things "merrier" has always been a part of my life. I have gotten an early start with my merry making this year. There are a few things I found on line that not only saved me time and money, but relieved me from the frustration of fighting crowds. Plus, this way, I always get what I want! I I found several worthwhile products this year. I was delighted with my order. 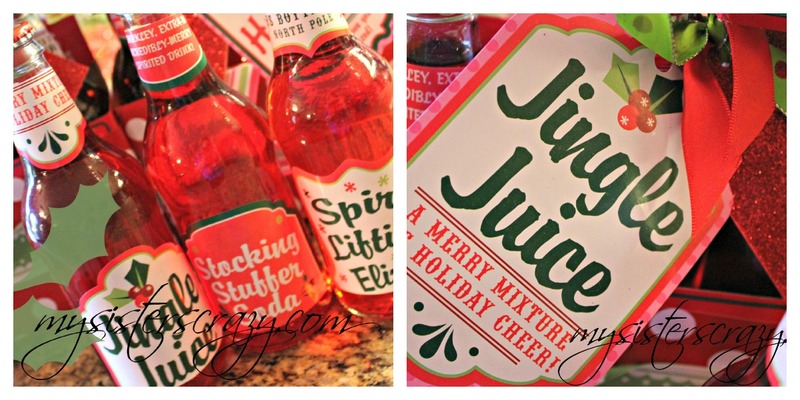 I ordered fantastic little appetizer forks, adorable "Santa Soda Pop" stickers, and great little gift boxes, all of which are fantastic and definitely going to make Christmas a little merrier! The tiny red and green forks were right around .80 cents a box. (box of 24) Excellent buy! I can’t wait to use them! I have a killer meatball appetizer that is screaming for tiny forks. These are gunna get a lot of merry making action! The soda stickers were too adorable, I could not resist! They come in packages of 12 with 4 varying styles. The package of 12 cost .99 cents. (So, basically really cheap). I could not print out this many labels at home for that cheap. I could not wait to get them on the soda bottles. I was a little disappointed at the strength of the “sticker”. They needed a little glue. However, I didn’t mind, like I said, I couldn't have bought paper and printed them out for cheaper. I figured they would make darling gifts. I wrapped the soda boxes with wrapping paper and simple ribbon. If you know me, expect one of these to show up on your door step. I can’t resist a tiny box. These are adorable. They are a cheap little box but, do their job fantastically! I bought a couple of different types. The red and green polka dot little guys are the perfect size for a couple of chocolate dipped oreo cookies, a cake pop, or some other delicious little treat. They say "good things come in small packages"...well, when the "good thing" isn't so hot, it helps when the small package rocks! I bought the bigger striped boxes for things like; toffee, caramel popcorn, and it even makes a great “gift box” for a bottle of hand soap or lotion. I have thoroughly enjoyed my Oriental Trading order this season. Who new!?! Next, is my order from Onlinefabrics.com. They have fabulous burlap bags, all sizes, all shapes, all colors. I ordered giant burlap and smaller red and green drawstring bags. 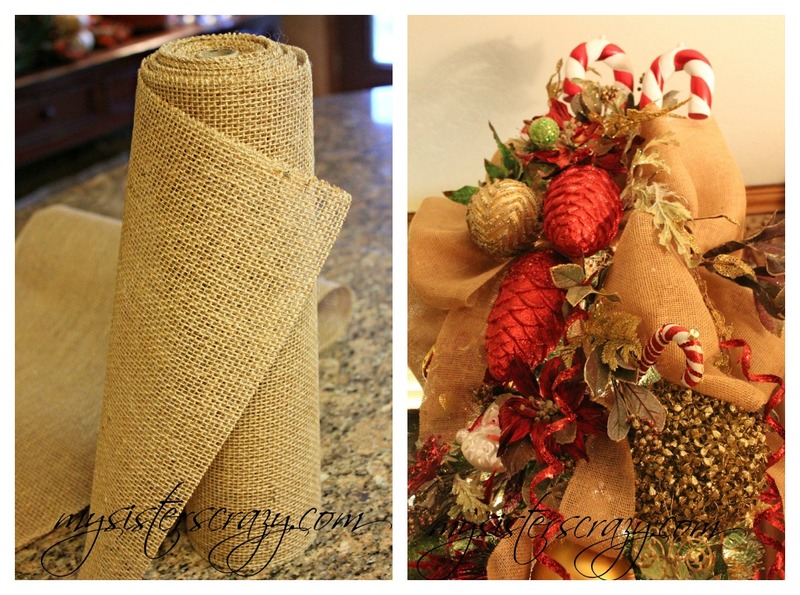 My wrapping is covered this year…covered by burlap that is! 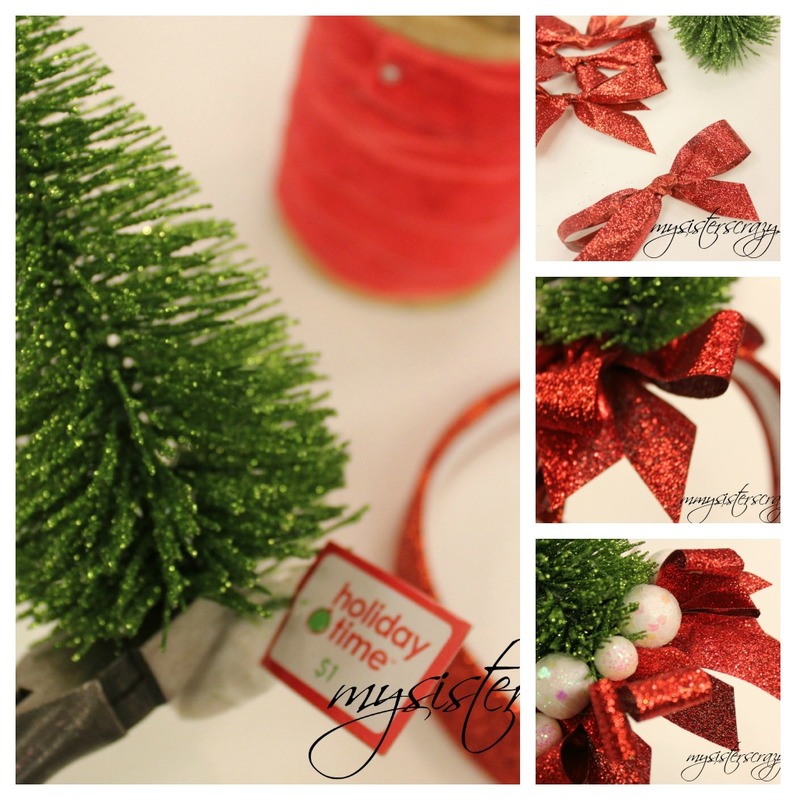 They have great colored burlap ribbons as well…I love the green spools I ordered. My only regret…I wish I had ordered more! I will most definitely be making another order. saveoncrafts.com is another gold mine! 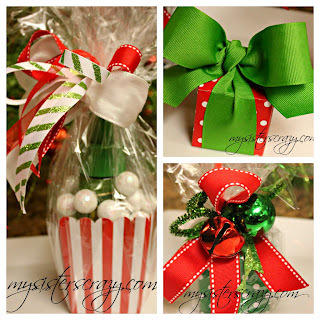 I bought several wide rolls of burlap which made killer giant bows for the tops of my trees. Don’t worry about quality; it is one of the best burlap purchases I have made. The Edges are finished beautifully! If you have a couple of days to wait…order it online! 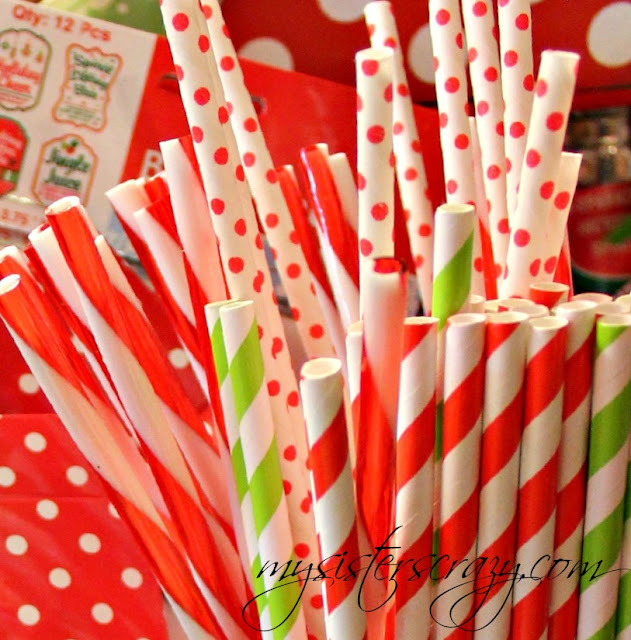 The last hot topic I would like to cover is the “fancy straw” craze that has taken over the craft/baking world. ORDER THEM ON LINE!!! They are difficult to find in quantity in local stores…at least where I live! I have bought them from Etsy and a number of other places. ORDER ON LINE, WAAAAAY CHEAPER and you actually can find the colors you need. That is all I have to say about that! Glass jars always make things Merrier! 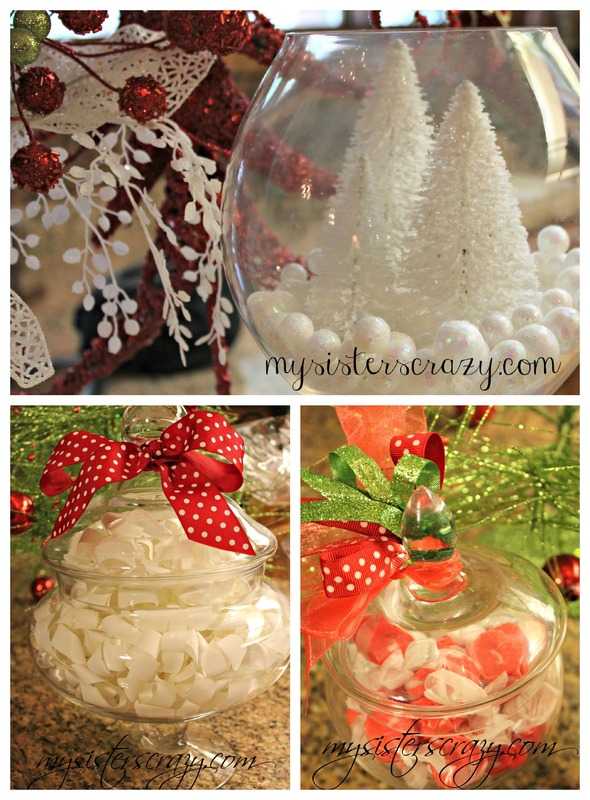 This year’s glass jars got a unique and inexpensive twist. An easy go to... Curling ribbon. I didn't even curl this stuff myself. I bought a couple of precurled giant white bows from the Dollar Tree. In my eyes this jar looks like a merry jar of Santa beard...wait actually saying that in print sounds twisted. CUZ...a jar of Santa beard would actually be gross! SHOOT! Anyway it's working for me! Walmart carries the cheapest fake snow around. It is right around $2.50 for a giant bag. I like to mix snows. I buy one white flaky snow and one white iridescent snow. I use 2 parts flake white snow and 1 part iridescent. You can find them in the miniature Christmas village section. Fun way to fill a jar! I also use the fake snow as a base for the jars that I put a little house setting in. 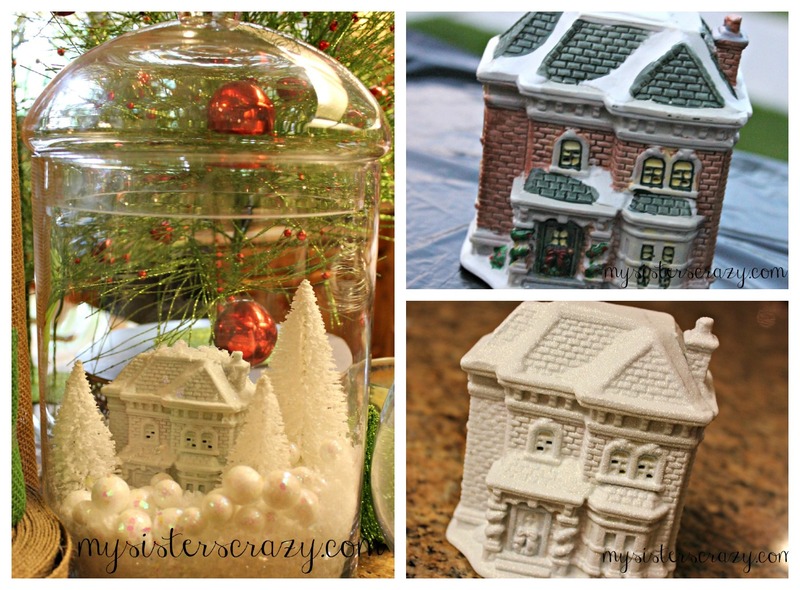 The cheap dollar Christmas village houses sit in a jar nicely. I like mine a little simpler looking then they originally come, so they got a shot of primer and Glitter Blast paint. A tiny Christmas house and a little snow…what more could you want...well, a few sparkly trees of course! They too are a dollar or under in most craft stores and of course the “Mart”. Boy, how I love a magical snow setting! If you don’t want to get that complicated…just one lone little ornament makes quite the statement. It says, "I am fantastic all by myself!" RIGHT!?! And there is always candy…the kids love the candy jars. I have had my fair share of chipped glass wear this way. Be cautious putting the jars in places little hands can reach. They can’t resist a peppermint taffy…I Don’t blame them , neither can I! On line shopping does me right! I would feel bad for my debit card but, I have been very careful placing my orders this year. I did a pretty good job keeping it inexpensive. Remember, I doesn't have to be expensive..,just thoughtful! #WINK!